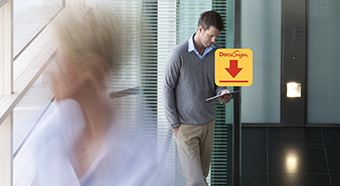 DocuSign helps facilities teams optimize the processes needed to run physical premises, increasing visibility into key processes, and making on-site interactions more pleasant for customers, vendors and employees. Streamline the lease signing process, handle complex negotiations and approvals, automatically calculate fields, and even manage payments. Speed execution of services by standardizing and automating the way facilities contracts and agreements get executed. Make check-ins delightful and improve security by using DocuSign to register visitors, alerts employees, and automate NDA signings. Save time to authorize, estimate, track and pay/bill for work orders, and also integrate directly with your finance or business systems. Use forms to handle employee and department requests, and leverage automated workflows to route approvals and signed work orders. Manage and issue permits and passes to employees, contractors, and partners by obtaining electronic acknowledgement and signatures. Talk to our Sales Team about all of your business needs. See for yourself how easy it is to send, sign, and store agreements using DocuSign.